For our monthly stamp club (SALSA - Stampers At Large Stamping Away) I accepted the challenge of using a designated mystery item that was handed out at our May meeting. It was a couple little washers that looked like gears. I hemmed, I hawed, and finally, the light bulb lit up! Do you see them? They've got our colorful Spring Accent Dots on them! 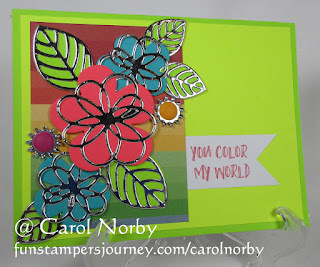 The pattern paper is retired but I used bright card stocks from our Be Amazing Collection, Sour Lemon, Electric Lime, Turbo Teal, and Outrageous Pink. The bright silver paper is new and is called Mirror Silver. It is so very very shiny!! I also used our Whip Cream card stock for the text banner. How do you like the flowers and leaves? 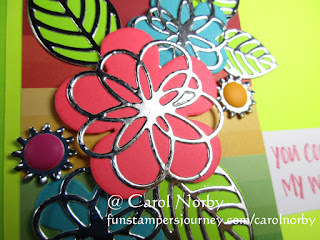 They're all from a new die set called Blooming Details die set. I just love it! And the text is from our Color World stamp set. It was 1 long line but I cut the stamp in half. I used Outrageous Pink ink to stamp it. I am having computer issues, picked up a virus or something recently so will have to find someone to clean it up as my computer guy is on vacation until the end of the month. Bummer. Hope you have a great Independence Day celebration! Somehow I've been locked out of my FaceBook account and may have to open a new one. I'll keep you informed. LOL...those are external tooth lock washers! I know very well as I sold bolts and nuts for 25 years! 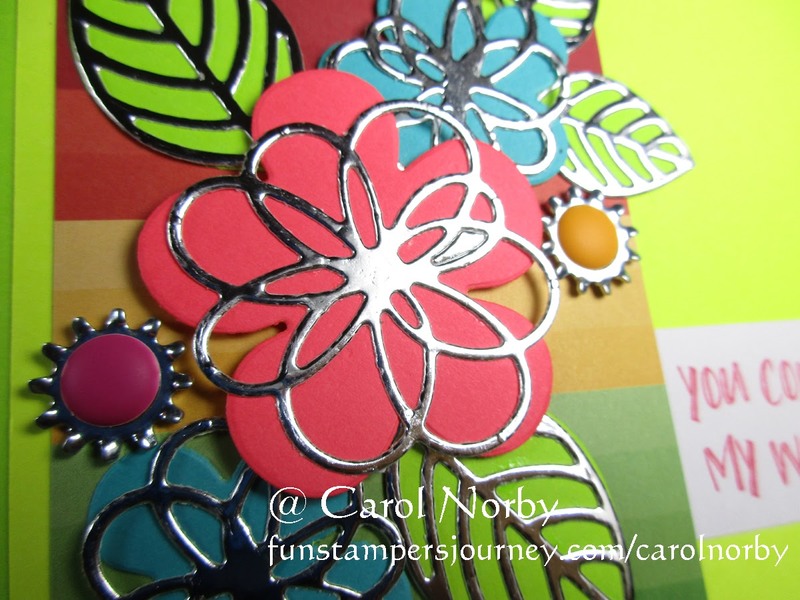 There are quite a few hardware items that are fun to use on cards and scrap pages. Very cute card too!